China’s toy industry posted strong growth in 2016, countering recent trends in China’s light industry sector. 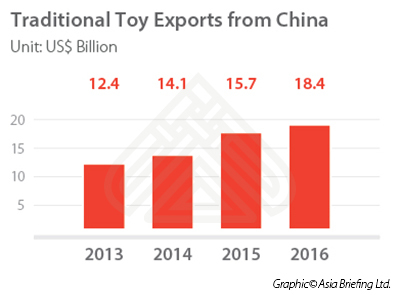 While China’s total exports dropped by 7.7 percent and imports by 5.5 percent in 2016, toy exports rose by 9.5 percent and imports by 23 percent. Although lower cost manufacturing locations in India and Vietnam have attracted investor attention, China’s toy industry has been performing well due to a shift in the country’s burgeoning domestic consumer market and advanced manufacturing processes. Given the maturity of the industry, however, foreign investors must be strategic when entering the market to compete with established players. China is the world’s largest toy manufacturer, producing around 70 percent of the world’s supply. Total export value of toys reached $33.7 billion in 2016. Of this, traditional toys, including dolls, puzzles, educational toys, etc., were valued at $18.4 billion. Most of China’s exported toys are produced by OEMs who manufacture for foreign brands. China has numerous toy industry clusters along its affluent east coast. Guangdong province alone produces over half of the world’s toys, with the cities of Dongguan, Foshan, Shantou, and Shenzhen leading the way. Other major toy production sites include the cities of Yiwu, Yunhe, and Wenzhou in Zhejiang province; Yangzhou in Jiangsu province; and Linyi and Qingdao in Shandong province. The city of Jiaxing in Zhejiang province has also emerged as a major toy producer after Danish toy manufacturing giant, LEGO, opened its first Asian plant there. The 160,000 square meter plant will employ some 1,200 workers and produce 80 percent of LEGO products to be sold in Asia. Overall, there are more than 10,000 toy manufacturers in China. Collectively, they employ around six million workers. Both Chinese and foreign manufacturers have been investing heavily in automation and R&D to increase efficiency and offset rising labor costs. Additionally, the increasing popularity of more complex and high-tech toys is fueling the need for more advanced technology and production methods, as well as higher skilled employees. Low cost manufacturing initially drove China’s toy industry, but the emergence of a massive domestic consumer market has fostered its continued growth. The China Toy & Juvenile Products Association projects that China’s toy market will grow by 9.2 percent in 2017 to reach 60.7 billion RMB ($8.8 billion). China’s rapidly rising income levels have made the country a giant consumer across a growing number of industries. However, it is not only soaring wealth that is increasing toy consumption. The abolition of the one-child policy in late 2015 in favor of a two-child policy is expected to bring an influx of newborns, which should lead to increased demand for toys in the short to medium term. According to the Hong Kong Trade and Development Council, the two-child policy will lead to an additional 2.4 million babies born in China each year, contributing 75 billion RMB ($11.5 billion) to the toy industry. In total, the National Health and Family Planning Commission expects the number of newborns to hover between 17.5 million and 21 million annually over the next five years. Currently, there are about 226 million children under the age of 14 in China. According to Chinese e-commerce website Baobei360, which concentrates on baby products, the average amount spent on toys per child under the age of 16 in China is less than $30, compared to over $200 in the US. This suggests that there is still significant growth potential in toy spending per child, particularly given that Chinese parents have consistently shown a willingness to invest heavily in their children. Despite the implementation of the two-child policy, many families in the wealthier first-tier cities do not plan on having a second child, largely due to the high cost of living. For example, only 10 percent of eligible couples in Beijing said they would take advantage of the two-child policy. Rather, it is China’s less developed, but increasingly affluent lower tier cities where the birth rate is expected to be higher. Given the industry’s growth potential, the competition is intense, both in term of cost and innovation. Traditionally, foreign brands dominate the higher end of the market, while domestic brands control the lower to middle end of the market. Electronic toys that are more interactive than traditional toys have strong growth potential. This is true for both conventional toys, like action figures, as well as experimental products, such as virtual reality and intelligent toys. Toys that are both interactive and educational are a particularly popular subsector, especially among parents. Plush toys that depict cartoon characters are popular both among children and adults of all ages, and are often used for decorative purposes. Although homegrown Chinese cartoon characters are slowly gaining prominence, this sector is still dominated by Japan and the US, and South Korea to a smaller extent. The popularity of foreign cartoon characters offers ample opportunities for licensing. However, despite improvements in IP protection, counterfeit products are still rife. Foreign investors should therefore make concerted IP protection efforts when entering the market. Although China’s toy industry has outperformed light industry as a whole, it faces challenges going forward. Intense competition among domestic toy manufacturers – many of which compete on cost –drives down margins. Land and labor costs continue to rise, meaning higher upfront investments into higher tech production methods is increasingly crucial. These factors will lead many to consider lower cost alternatives. However, as evidenced by LEGO’s massive investment in Jiaxing, the sheer size and spending power of the Chinese market can offset many of these challenges. As is the case with many of China’s traditional manufacturing sectors, investments into innovation and automation, and a recalibration towards the domestic consumer market are keys to take advantage of China’s economic restructuring.